(Feb. 06, 2016) – A study from Harvard’s Berkman Center for Internet Society released on Monday last week refutes claims that wider use of encryption in software products will hamper investigations into terrorism and crime. Jeremy Samide, the Michael Dukakis Leadership Fellow and Lead Consultant to SteathCare Labs, shared his opinion on the report. 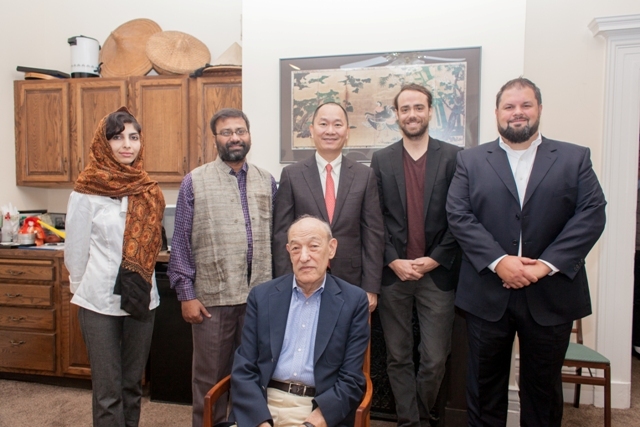 Jeremy Samide (on the right) in a meeting with Professor Ezra Vogel during the week in Boston as a part of Michael Dukakis Leadership Fellow Program in September 2015. Accessible, unencrypted data will be available to law enforcement and will continue to dominate the Internet, a Harvard study coming from the Berkman Center for Internet Society says. The study, which was released last week, refutes the claims made by law enforcement and many governments that the use of wider encryption in applications will hinder investigations into terrorism and crime. With the expansion of Internet connected devices like smart TVs, home cameras, thermostats and vehicles, these devices will offer new opportunities for tracking targets. The technology industry has come under pressure as government officials in the US and UK, who say that increasing data security through encryption will diminish their capabilities to fight terrorism and crime. As end-to-end encryption continues to gain popularity within systems, it leaves users the sole possession of the decryption keys. Without a password, other means to attempt to decrypt data would need to be used by law enforcement. Back doors and special keys designed for the sole purpose to circumvent encryption only weakens our defenses globally.